Say "office laser multifunction printer," and most people think of a mono device; but increasingly companies are choosing colour - around 40 per cent according to HP sales figures. While most business documents are still primarily monochrome, the use of colour in graphs and charts and in photographic content has proven its worth in internal documents, as well as sales and marketing materials. A business printer with scanner attached immediately becomes the ideal vehicle for scans, faxes and copies, as well as simple prints. If it also supports USB at the front panel, it can be used for walk-up prints and take-away scans, too, though the security implications of this convenience have to be considered, before allowing free access. With many firms now encouraging their employees to Bring Your Own Device (BYOD), the requirement for print from a range of notebooks, tablets and phones is growing in importance, so a shared printer needs to be on the wireless network, but also to offer direct connection, via protocols like Wi-Fi Direct. Modern network printers need to offer secure printing, such as the ability to deliver a job only when a PIN or password is typed at the control panel. This ensures that if confidential material is printed on a shared printer, only the originator of the print gets to see it. This kind of access control is also important if print costs have to be allocated to individual employees or departments. 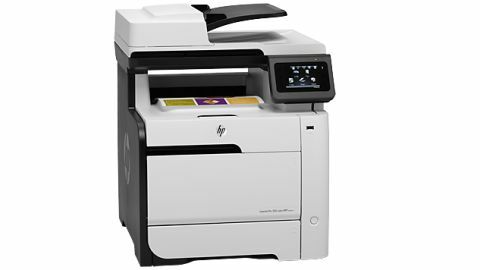 HP's marketing folk have excelled themselves with the naming of this colour laser multifunction, which they've titled the LaserJet Pro 300 Colour MFP M375nfw; about twice as long as it need be. In other ways, though, it's a purpose-built machine for the small business, offering most of what we've already highlighted is needed in this type of machine. A fairly substantial scanner, complete with 50-sheet, 300ppi Automatic Document Feed (ADF), and a feed tray with a jaunty curve sits on top of the machine. Neither the scanner head nor print engine is duplex, which is a bit of a shame, but the scanner lid is mounted with extending hinges, making it much easier to scan from books and magazines. The flatbed resolution runs to 1,200ppi in colour. The control panel, which looks like a small tablet latched to the front of the machine, has an 89mm touchscreen, with columns of three touch buttons down either side. The menu system is logically designed and it's easy to find your way around the main functions of the printer. This includes providing a number pad for fax dialling. Below the controls are two paper trays, a main one with a capacity of 250 sheets and a pull down multipurpose tray which can take another 50 sheets. A second 250-sheet tray is available as an option. The four toner cartridges slide out from the front in a single tray and changing a cartridge takes just a few seconds. The photoconductor drum appears to be a lifetime component and is not quoted as a consumable. At the back are connections for USB and 10/100 Ethernet, together with sockets for a phone line and extension handset. There's support for wireless, too, with 'Wireless Direct', HP's take on the Wi-Fi Direct standard. This means you can connect a wide variety of devices - including Apple and Android - using HP's free apps, and print directly, without the need to access any infrastructure network the printer might be connected to. There's also a front panel USB socket, so you can connect a USB drive for walk-up printing and to scan documents to. This use might have to be approved by IT management, if the machine is used in a company with particular concerns about data security. HP specs the LaserJet Pro 300 Colour MFP M375nw at 18ppm for both black and colour print. Using our standard print samples, which reflect typical office use in producing reports and discussion documents, they seem a bit optimistic. The five-page test piece (the average office document is currently four pages) gave a speed of 8.6ppm, less than half the stated speed. This improved in our long document test of 20 pages, which returned 13.8ppm. A five-page black text and colour business graphics print gave 10ppm. While not up to the claimed speed, none of these results are bad. They're all are in the same range as speeds from similarly priced competitors. A single-page copy took 21 seconds from the flatbed and a five page copy from the ADF took 38 seconds. 15 x 10cm prints from a PC and from a USB drive in the front panel socket took 19 seconds each. Printing from an Android phone via Wireless Direct took 49 seconds, and 1 minute 8 seconds via ePrint. All these times are acceptable from a machine at this price. One of the reasons our real-world tests give slower results generally, is that the ISO speed test standard permits manufacturers to exclude pre-processing time and measure just the speed from page to page, once printing has started. This is unrealistic, as if you are waiting for a print-out, the complete time from clicking Print to the last page arriving in the out tray is what's of interest. That's what we measure. Print quality is good throughout, with sharp, dense black text and bright colours in business graphics. Fills are solid, with no signs of fill patterns, and reversed text is well outlined, with no infill. Photos are also good - better than from some colour lasers, which emphasise the colours within their reduced gamuts, giving a 'cheap postcard' effect. Laser printers can be noisy, but this machine peaked at 61dBA at half a metre, which is quiet, so you should be able to position it close to a desk without problem. The basics are all in place with this machine: it prints well in black and colour, does it reasonably quickly and doesn't cost the earth to run. We calculate a cost of under 2p for a black page and under 12p for colour. The front-panel USB socket works for print and scan, and support for a number of different wireless print protocols make this a versatile printer in BYOD environments. This is also a quiet machine - a good five or six decibels quieter than some of its rivals. This may not sound a lot, but remember noise levels are measured on a logarithmic scale. There are a few missing features you might expect to be in place on a colour multifunction at this price, though. Most pressing is duplex print, which is increasing in its importance, as companies get more eco-conscious. Some devices at this price include duplex scanners, too, so all printed output can be duplex by default. Colour print costs, while not exorbitant, are a little high for this class of machine. Some of its rivals cost a penny or two per page less, which can build up if the machine is subject to a heavy duty cycle. As many people have come to expect with HP, printers and multifunction devices from the company are sound business workhorses. That's true of the LaserJet Pro 300 Colour MFP M375nw, which combines good print quality in both black and colour with reasonable speed and fair running costs. The convenience of its touchscreen control panel, easy access, pull-out toner tray and its strong wireless provision tick many corporate boxes. As colour print increases in popularity, the colour laser multifunction market is becoming more crowded, but with quality machines like this one, HP stands in good stead to maintain its share.